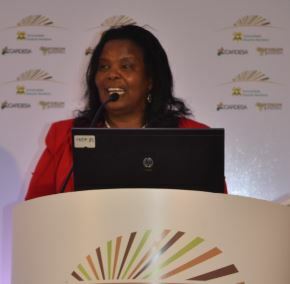 But after listening to a key note address delivered by Professor Olive Mugenda, the incumbent Vice Chancellor of Kenyatta University in Kenya, it is clear that these female frontline innovators can be significantly an critically assisted by transformative female leadership in the higher echelon of university administration systems. Leadership styles – by which people providing direction, implement plans and motivate those around them – vary considerably, both between and within the sexes and across fields such as politics and business: from the authoritarian and dictatorial to the democratic, from the paternalistic to the laissez-faire, and from the transactional to the transformative. Professor Mugenda certainly falls into the transformational leadership category. Having been in position for 8 of a 10-year period, she has managed to change fundamentally the perceived needs and thinking of her colleagues, at all occupational levels, challenging existing customs, cultures and expectations – which had been nurtured by her male predecessors – and inspired her ‘followers’ with a sense of purpose and energy in the pursuit of a shared vision for change. Her achievements have been remarkable. With lessons partly learnt in the USA during her doctoral studies – and with initially minimal funding that was supplemented latterly by a combination of hard-earned grants and financial credit arrangements – between 2006-14 the number of academic programmes at the university doubled from 145 to 292, starting a number of new schools, including that of agriculture. Student numbers increased over the same period from approximately 15,000 to 74,000; numerous new buildings – and those that added additional floors to existing structures – have been erected, including a highly modern library and the first university-owned, 600-bed teaching hospital, either at the main campus or at its satellite sites. Outlining the factors underpinning her success, Professor Mugenda highlighted boldness, ambition, and international linkages, supplemented by a systems approach to leadership that entails: a strategic plan, identification and use of effective change agents, the measurement of performance for accountability and progress, investment in capacity building, the creation of partnerships, a sense of urgency and, ultimately, a hands-on approach to effective implementation. 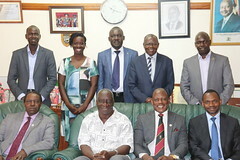 It is that hands-on approach, from a charismatic African leader in higher education, that has helped shatter the traditional glass ceiling blocking females’ progress in leadership and which will ultimately help those identified by Professor Juma as critical to agriculture on the continent: women.